Southampton suffered League Cup elimination last night after a 0-1 loss to the Blades. SOUTHAMPTON MANAGER RONALD KOEMAN slammed Sheffield United’s coaching staff after his side’s 1-0 defeat to the League One outfit, accusing them of showing a lack of respect. Koeman’s side travelled to Bramall Lane looking to secure a place in the League Cup semi-finals, but suffered a fifth successive defeat in all competitions. Marc McNulty netted the game’s only goal in the 63rd minute, pouncing on an abysmal mistake from Saints goalkeeper Fraser Forster. United assistant Chris Morgan was sent to the stands almost immediately after the goal as Koeman found himself in a verbal battle with the hosts’ backroom team. And in response to what Koeman felt was disrespectful behaviour, the former Barcelona defender refused to shake the hand of opposing manager Nigel Clough at full-time. He explained: “I shake hands with people who have respect for me as a coach, who have respect for the fourth referee [official]. To make matters worse for Koeman, Southampton will be without suspended trio Morgan Schneiderlin, Victor Wanyama and Florin Gardos – who was sent off in the latter stages of the clash – as they look to avoid a sixth consecutive defeat when they host Everton on Saturday. “It’s difficult,” acknowledged Koeman. “In my opinion that’s one of the problems in the last few weeks – we have to change every time the team and with injuries with suspensions and, okay, suspensions is part of football and injuries is a part of football, but we have not a lot of midfielders available. “We had to make choices. Schneiderlin played finally 90 minutes. Normally he wasn’t allowed to play 90 minutes but we had to change and that was the problem and we knew that before the season. Email “Ronald Koeman slams the behaviour of Sheffield United's coaching staff”. 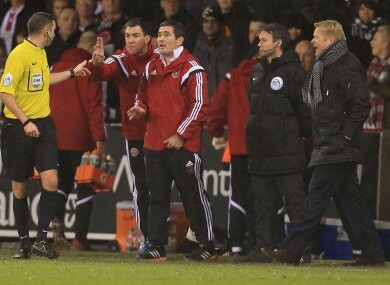 Feedback on “Ronald Koeman slams the behaviour of Sheffield United's coaching staff”.